Mount Hallasan’s immense presence, in the centre of Jeju Island, commands everyone’s attention. Many have reached its volcanic peak during spring and summer, but its otherworldly beauty appears only in winter. Before setting foot on the trails of Korea’s highest peak, discover what makes Mount Hallasan an unparallelled natural treasure and prepare for a winter hike that will reveal a sight of pure spectacle. Mount Hallasan, one of the three spirit mountains in Korea, is a treasure trove of flora and fauna. For this reason, the Korean government designated it as a Natural Monument in 1966. Decades later in 2002, UNESCO named it as a Biosphere Reserve. According to experts, Mount Halla was once an active volcano, erupting some 25,000 years ago. The volcanic cones in its surroundings lay proof. With all the vivid scenery, anyone who comes across the mountain gasps in sheer awe. And as the seasons shift in color, so does the mountain. In fall, red foliage sweeps across the landscape. It evokes a fleeting movement that leads to the coming of white winter. Mount Hallasan differs in climate from Jeju City and Seogwipo City. While the sun is out in the metro, rain can drench the mountain. In winter, this translates to a thicker surge of snow and ice. A hike may seem arduous at this point, but designated trails are set to lead climbers the summit. The Eorimok Trail is one of the easiest routes for occasional hikers. It starts at the Mount Halla Mountain National Park Visitor Information Center (970m above sea level) and then passes along Sajebi Dongsan (at the 2.4 km mark). Then it leads to Manse Dongsan (at the 4.7 km mark) up to Witse Oreum (at the 6.8 km mark). With a good, steady pace, the hike may last for three hours to the top. On the ascent, an icy wonderland of whites and blues unfolds. Snow-covered branches and blanketed mountain slopes gleam across an exhilarating vista. 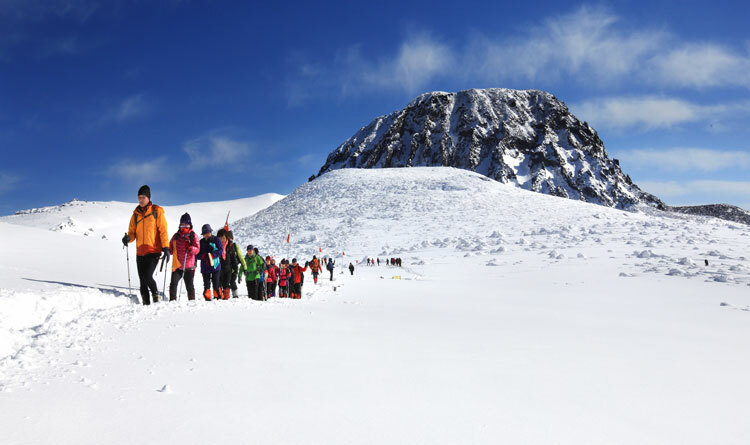 Hikers, who have reached the peak of Mount Halla, attest the dazzling snowscape. A winter hike of Mount Hallasan isn’t for the faint of heart. The extreme environment requires preparation and precautions. A good winter coat, hat, and gloves come as the basics. Next, proper hiking equipment such as boots and staffs are also as essential. As the winter sun can be harsh on the skin, sunglasses and sunscreen are the best lines of defense.